New Slab Master Crappie Spinners are a premium crappie spinner. 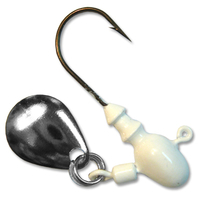 Same great balance and collar design as the original Slab Master Jig Head with a spinner added. This bait was tested in the fish tank at a boat show and was the hit of the show. These Crappie Spinners are a real fish catching bait. People at the boat show thought we had super glued the bait on but that is not the case. It is the collar design that holds the bait in place. Slab Master Crappie Spinners are $1.35 each.